1.55-Volt silver-oxide battery.It is specially designed for watches and will last approximately 12-18 months under normal use. And, 1 more kashidun random gift. The History of Kashidun, With the first watch made in Previous time, Kashidun entered the Hongkong watch market in 1982 when the watch industry discovered huge potential about our brand's technology, design, and value. 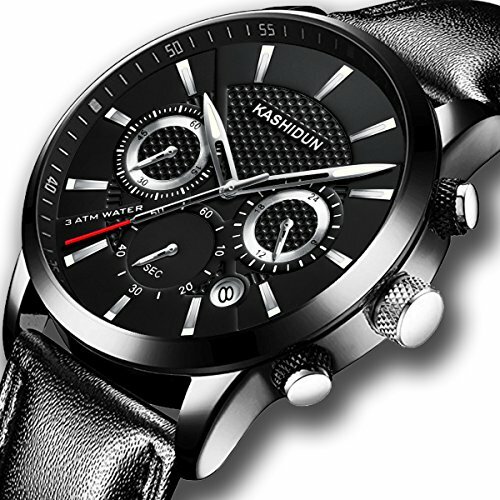 At 2008, Kashidun entered Chinese online watch field confident that it could develop timepieces that would lead the market and we did it as the top three. After that, We explored the Asian watches market (Japan, Korea, Singapore, Thailand, and Taiwan, etc.) in 2014. Now, Kashidun is not only focusing its efforts on the Asian-Pacific region market but also will exploit the oversea market. However, the most important are our products which are Kashidun Watch. Kashidun is always with a spirit of the craftsman and moving time forward. Chronograph functions and date window(an easy to operate date window is located at 4 o'clock). If you have any questions about this product by KASHIDUN, contact us by completing and submitting the form below. If you are looking for a specif part number, please include it with your message.